The Arizona Legislature is asking voters to temporarily raise the sales tax by 1%, until May 31, 2013. To see the transmitted bill, click here. The election will take place on Tuesday, May 18, 2010. The following is information that will explain the proposition's potential impact. What are the specifics of Proposition 100? Proposition 100 proposes a 1% increase in the Arizona state sales tax. Two-thirds of the revenues generated would fund education and the other one-third would fund health and human services and public safety. The sales tax would automatically repeal on May 31, 2013. Will it really repeal automatically? Yes, it will repeal on May 31, 2013. It would take a two-thirds vote of the legislature or another voter proposition to keep the tax increase in place. What happens to education funding if Proposition 100 does not pass? If the temporary 1% sales tax does not pass, as much as one-quarter of all public education funding could be cut! This could mean 1.5 to 2 of out of every 10 teacher positions may be eliminated. Will there be additional cuts to public schools even if Prop 100 passes? Reduction of state funding per-student from current levels to FY2005-06 funding levels. Elimination of state funding for Gifted Programs, Teacher Training, Adult Education and GED, and the Early Education Block Grant. No funding for regular School Building and Maintenance. Only $5 million for emergency maintenance state-wide. Reduction of support for Community Colleges and Universities to FY 2005-06 levels. Per-pupil support would drop for universities from $9,480 to $7,100 per student. Register to VOTE and apply to receive a permanent early ballot. Click here for links to your county board of elections. The last day to register to vote is April 19, 2010. Early voting begins on April 22, 2010; the last day to request an early ballot is May 7, 2010. Talk to your family, friends and neighbors about Proposition 100 and its importance to the economic future of Arizona. Print out this one page handout : What You Need to Know About Proposition 100-The Temporary 1% Sales Tax, pdf. AEN submitted a pro statement in support of the passage of Proposition 100 - The temporary sales tax. To read the statement, click here. 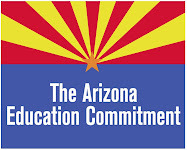 The Legislature has already cut Arizona public education funding with more cuts expected. We want to know how these cuts are affecting your student, their classroom and your school. Send us your stories, your videos, your view and we will post it on a new section of our web site. We will also be featuring individual stories in our newsletter. We want to hear your voice! Click here to send us your story. To read stories submitted to AEN, click here. • Follow us on Twitter, AZEducationNet.